Political science student Phi Nguyen had long dreamed of visiting New York City, where “all cultures come together, and you can see the whole world in one place,” he said. Nguyen’s first trip to Manhattan, with 13 fellow Sacramento State delegates to the National Model United Nations conference in March, could hardly have been more satisfying. At the conference, the Sac State group joined thousands of other students from across the globe. There they discussed and debated pressing world problems, including human rights, economic and social development and water quality. In the process, they built a keen understanding of the inner workings of the United Nations, practiced diplomacy and compromise, and polished their public speaking and research skills. They also came away with a top prize, earning one of 27 Outstanding Delegation awards given out at the international competition. Sac State delegates Sarah Boyer and Briana Cravanas also won an Outstanding Paper award for their research on women’s issues. Nguyen was chosen to deliver a short speech about gender inequality inside the United Nations General Assembly Plenary Hall. More than 5,000 students from 130 countries and 159 schools participated in the event, which seeks to advance understanding of the U.N. and contemporary international issues. “The Model United Nations program is transformative for students,” said Sac State political science lecturer Janice Shiu, faculty advisor to the program. “In addition to the rigorous academic preparation for the conference in New York, the students are exposed to a very dynamic atmosphere that tests their diplomatic skills in public speaking and consensus-building to reach resolutions in an international and multicultural environment. Sac State’s delegation also included Sanjana Ahuja, Daniel Amon, Louis Asbury, Kyle Ellsworth, Jordan Lorenz, Claudia Ramirez, Jennifer Schultze, Marissa Turner-Smith, Yessica Vergara, Cameron Weaver and Danial McGhie. The students prepared for the competition by spending a year studying U.N. treaties and procedures, then intensively researching various topics assigned by competition organizers. 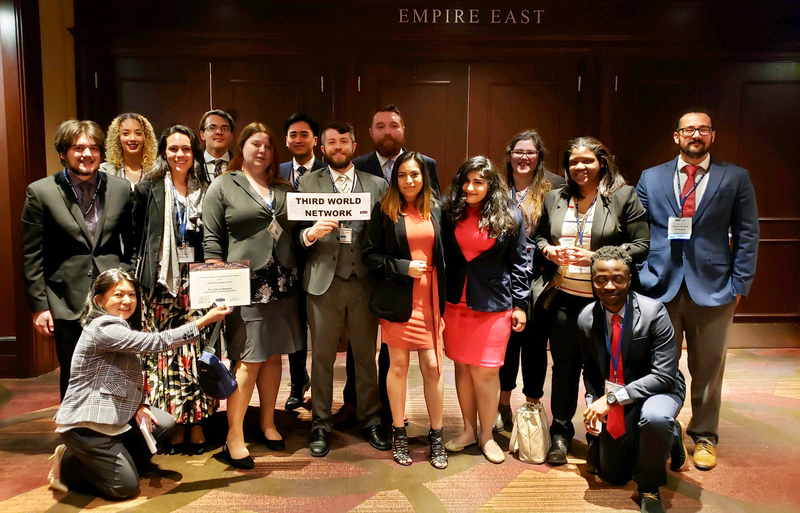 At the event, they took part in committee meetings and caucuses, acting as representatives of the nonprofit Third World Network in simulations of actual U.N. sessions. For four days, the conference was in session “sunup to sundown,” said McGhie, who served as head delegate for the Sac State group. Boyer said she was moved by her interactions with young people from Europe, Africa, Asia and other far-flung places. Outside of the conference, Sac State students managed to find a few hours to see Manhattan. They visited museums, the Stonewall National Monument and the New York Public Library, among other places. Nguyen walked through Central Park, and spent hours in the American Museum of Natural History.